Coller Capital Limited (“CCL” or “we”) is committed to protecting the privacy of current and prospective counterparties, investors, suppliers and other business contacts as they interact with the firm in person, through the internet, or by other means. CCL is sensitive to the privacy concerns of individuals with whom the firm interacts and has a long-standing practice of protecting the confidentiality and security of personal information. Additional information regarding privacy issues may be provided to you in connection with a particular product or service provided or contracted by us or any of our affiliates, whether through a website, by telephone, or in writing. Such additional information may be required by applicable law or as a result of the type or nature of the product or service in question. You are encouraged to read all information provided to you in connection with the use of your information. "Personal Data" means data relating to you from which you can be reasonably identified. Examples of Personal Data include your full name, email address, postal address, telephone number, job title or the company you work for. We recognise that your Personal Data is valuable and we process it in accordance applicable law, and to the extent that it applies to your Personal Data, with European Data Protection Legislation. CCL is the Controller responsible for the processing of your Personal Data collected from Websites under the European Data Protection Legislation (to the extent that it applies to Personal Data collected about you) and other applicable law. We collect Personal Data to allow us to provide you with services and deliver information on the products and/or services offered by us. We make sure that the Personal Data we collect from you is necessary for and directly related to this purpose. We will use and process your Personal Data lawfully, fairly and in a transparent manner. The Personal Data we collect from you may include but are not limited to your name, address, e-mail address and phone number, business affiliation and other relevant personal details. Personal Data may be collected when you access our public website or any other site we use, enquire about our business, speak, meet or correspond with our employees or representatives, subscribe to a service, search for a publication, or otherwise interact with us. provide you with information related to CCL and its affiliates, including products, services and other privileges, benefits and other advantages from time to time offered, and share information about relevant services, news and events in relation to CCL's offering. You are entitled to amend your communication preferences by contacting us at the email address listed under Contact Information below. If you subsequently decide that you do not want to receive correspondence from us about the services we could provide, you may do so by clicking the "unsubscribe" link provided in a promotional email message, by amending your communication preferences, or by post at info@collercapital.com and/or by post at Coller Capital Limited of Park House, 116 Park Street, London, W1K 6AF, Attention: Marketing department. We will let you know where you must provide us with Personal Data in order for us to be able to perform an agreement with you or to comply with a legal obligation. If you do not provide us with the Personal Data in these circumstances, we will be unable to respond to your enquiry and/or engage in further communications with you. In addition, we may from time to time notify you of other purposes for which we may process your Personal Data and ask for your consent where required by law. We may combine information we obtain from other sources with information you give to us and information we collect about you. We will use this information and the combined information for the purposes set out above (depending on the types of information we receive). improving our services, whereby we may occasionally display different versions of content to you and measure your usage of our Website pages. To the extent this information constitutes Personal Data, we use it to ensure that content from the Website is presented in the most effective manner for you and your device because it is in our legitimate interest to improve our customers' online experience in relation to the Website. 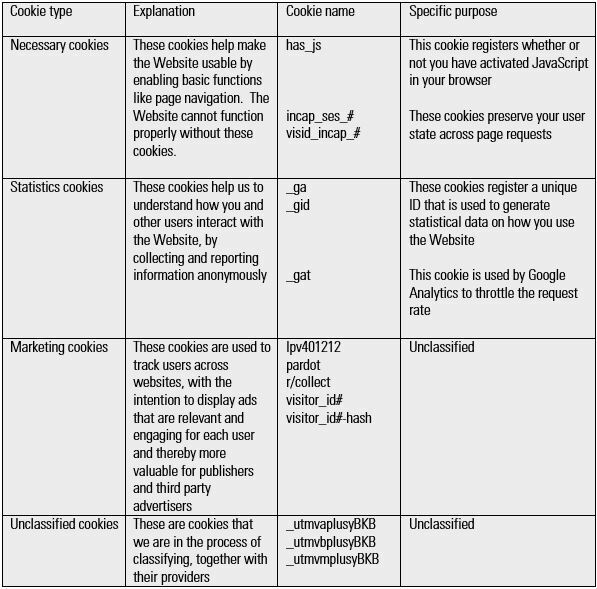 The following table sets out the types of cookies used on the Website and provides detail about what they are used for. When you use the Website for the first time, cookies which are essential to make the Website operate (see those identified as "necessary cookies" below) will have been set but other cookies will not have been set unless you agreed to those cookies being set at that time. If you have agreed to accept cookies, then the Website will remember this and continue to set cookies each time you visit. If you do not want cookies to be stored, then you may turn off certain cookies listed below individually or you can select the appropriate options on your web browser to delete some or all cookies. Please note, however, that if you block some or all cookies (including necessary cookies), you may not be able to use or access all or parts of the Website, such as being able to log on to member specific areas. investors in private funds or alternative investment vehicles in connection with closing documentation, investor reports, financial statements or other investor communications. a purchaser or successor entity in the event of a sale or other corporate transaction involving all or part of our business or as needed to effect the sale or transfer of business assets, or as needed for external audit, compliance or corporate governance related matters. We will keep a record of the Personal Data that we receive from you in order to answer any queries from you, respond to any requests for more information about the services and facilities we provide, and/or in order to provide those services and facilities. We will only retain the Personal Data collected from you for as long as your account is active or has otherwise not been cancelled and you have not requested that your Personal Data be deleted. We will retain Personal Data to fulfil the purposes for which we have initially collected it, unless otherwise required by law. We will retain your Personal Data for no longer than is necessary and reasonable to fulfil such purposes and/or to comply with our legal or regulatory obligations. Our policies and procedures address the retention of written and electronic documents, including those documents containing Personal Data about our contacts. We will make reasonable efforts to keep your Personal Data accurate, complete and current. We will delete our copy of your Personal Data within an appropriate time period after our last contact with you although we may retain a record of the existence of the relationship, to the extent and for so long as we are required to do so by law or regulation. For example, if you have contacted us to ask us for the processing of your Personal Data to be erased, we will retain a record of your request in order to ensure we comply with your wishes. We use appropriate technical, organisational, administrative and physical security measures to reduce the risks of loss of, unauthorised access to, or inadvertent destruction of, your Personal Data. We train our employees to handle personal and business information in accordance with approved policies and procedures that we have established to ensure compliance with applicable laws, regulations and internal policies for protecting Personal Data. Only those employees with proper authority and training are allowed access to your Personal Data. You acknowledge that the transmission of information via the internet is not secure. We cannot guarantee the security of your data transmitted to our public website, any other site used by us and accessible by you or through electronic communications, and any transmission is at your own risk. If you provide Personal Data to us, it may be transferred to, processed in, stored at or accessible from one or more destinations outside the European Economic Area ("EEA"), including territories which have not been deemed to offer adequate data protection by the European Commission. It may also be processed by staff operating outside the EEA who work for us or for another Coller Capital group company or a third party service provider. Such staff may be engaged in, among other things, the provision of support services. All practical steps are taken to ensure that all data is treated confidentially, kept secure and protected against unauthorised or accidental access, processing, erasure or other use and is maintained and kept no longer that is necessary for the purpose for which it is intended. If you provide your Personal Data to us in circumstances where our processing of it is subject to European Data Protection Legislation, please note that you are doing so on the basis that you explicitly consent to the transfer of your data outside the EEA. The potential consequence of you explicitly consenting to this are that there is a risk that your Personal Data will not be protected in a manner that complies with European Data Protection Legislation. You can withdraw your consent for this reason at any time by contacting us as detailed under the heading “Contact Information” below. Withdrawing your consent will not affect our use of the Personal Data prior to your withdrawing that consent, but it will mean that we will not be able to contact you about the services we may be able to offer you in the future. Where we pass your Personal Data that is subject to European Data Protection Legislation from a location inside the EEA to parties located outside the EEA that do not offer adequate protection as determined by the European Commission, and if they are not subscribed to an approved data protection framework, such as the EU-US Privacy Shield that permits us to transfer the Personal Data to them from the EEA, we will enter into agreements which enable us to transfer Personal Data to them and that enable you to exercise your rights in accordance with the European Data Protection Legislation. A copy of these terms can be obtained by contacting us as detailed under the heading “Contact Information” below. make a complaint to a European data protection authority about the manner in which CCL processes your Personal Data. Please contact us by e-mailing CCcompliance@collercapital.com if you wish to exercise these rights. In addition to the above, you have the right to review, update, and correct your account information and preferences at any time. You may do so by clicking "unsubscribe" links provided in promotional email message, by amending your communication preferences, or by post at info@collercapital.com and/or by post at Coller Capital Limited of Park House, 116 Park Street, London, W1K 6AF, Attention: Marketing department. If at any time you wish your Personal Data to be completely removed from all our systems, for example when there is no longer a legitimate or legal reason for us to keep your Personal Data, please contact us by e-mailing CCcompliance@collercapital.com. Please note that we may be required to retain certain Personal Data, but we will not retain such information for longer than is necessary for the relevant purposes. Please note, however, that we require certain key Personal Data from you in order to provide you with information or services and if you ask us to remove all or part of such information, you may no longer be able to use or access such information or services, including our public website or parts of it.